I know I way past due for a blog entry. So many things have happened since my last blog it is hard to know where to start and also difficult to remember all the things I want to include in this entry. One of the reasons for the lack of blogging the past couple months has been because "Along Came A Spider", the first entry in my list of what has come along in the last few weeks. 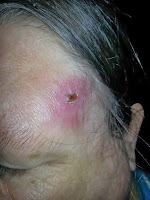 While the spider bite had me out of commission for a couple weeks, there is no excuse for the dry spell I have had on the blog other than once I get out of a routine, like regular blog entries, I often find it difficult to get back on track. So, lets start the list of "Along Came..."
When we first moved to our property I was a bit paranoid about brown recluse spiders. I fear spiders in general, and the horror stories I have heard from people that have suffered through brown recluse bites made me very cautious when we first moved into the house. We bug bombed the house and also regularly applied 'spider spray' around the baseboards and window sills. And for a year we saw no brown recluse. The site of the bite. In the summer we have some harmless grass spiders make it into the house. These 'skitters' as I call them, are very similar in size and appearance to the brown recluse, but the grass spiders have two dark stripes going down the length of their body, while the recluse has the tell-tale violin shaped mark on their head. While I can identify brown recluse, you need to be fairly close to them to verify their markings. This August, on two occurrences, I found a spider in our home office that upon closer examination I determined to be brown recluses. So, after living in the house for over the year, I saw my first brown recluse in the house. So, we once again applied the periodic spider spray. 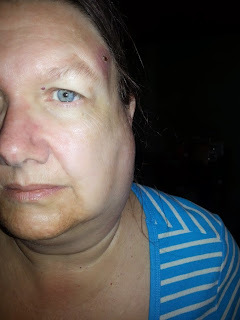 severely swollen lymph nodes . About a month later. I woke up to find one side of my face was swollen and I could feel hard lumps that were my lymph nodes along my jawline. I also had a red lump on my temple on the same side of my face. There was no pain and I could not find a puncture from a stinger, so I did not think it was an insect bite or sting and I assumed was another swollen node. For a week, the swelling got worse but there was still no pain. I decided it was time for a trip to the clinic. The doctor was not sure what it was, but felt it may be shingles and prescribed medication that he said would take effect within 48 hours. That night I had my first pain and discomfort and things went down hill from there. I had seen the doctor on Thursday, which meant the shingles medicine should have had me feeling better by Saturday afternoon. But, come Saturday, I was feeling even worse with body aches, chills and a temperature. I had a follow-up appointment on Monday at which the doctor stated that it obviously wasn't shingles, then consulted with another doctor in the office and they decided to send me to an ENT physician since my lymph nodes were so enlarged. When I arrived at the ENT, he took one look at the spot on my temple and said it was a brown recluse bite. He put me on strong antibiotics and within a few days I started feeling better as the venom worked its way out of my system. Needless to say, I am once again paranoid about brown recluse spiders. On a happier note, we did have a couple more friendly visitors one evening this past month. We got home after dark one night and discovered two horses in our yard. They were right next to our deck eating grass that had sprouted up from seeds the birds had knocked out of their feeders. These were probably two of the horses that had came out of the woods next to the houses and visited last year as you may recall from a previous post. I tried to entice the horses to stay the night by tossing carrots from the deck, but they moseyed on down the road, back toward their pasture. I guess this is an annual adventure for them. We are once again planning another upgrade (#6 below) and knew we should increase our solar power capacity to accommodate it. We are so pleased with our latest solar panel (the new Grape Solar we added to our array of Harbor Freight panels) we decided to add another Grape panel into our solar system. There was a friend in our Self-Reliance Group that was looking for a wood burning stove, and he happened to have a Grape panel he did not have in use. Since we had a 'spare' wood burning stove from our upgrade last January, we were able to swap for the solar panel. It was a breeze connecting it into the system, and with our current battery capacity we can actually utilize one more Grape panel which we hope to buy within the next few months. A new neighbor came to borrow a cup of wi-fi. About a month and a half ago, I heard someone whistling and looked to see a man walking up the road in front of our house. I was not outside, so he did not see me, but he turned toward the house and said something that sounded like 'I helped build that house' and continued walking on. A couple days later, I glanced out the window and saw the same man standing on the road in front of or house. He kept glancing down at his hand and back up. After a few minutes we realized he was connecting to our wi-fi with his phone. (We had unlocked it when our kids were visiting and never bothered to lock it back up, because who wold be accessing it out here in the middle of nowhere? He then walked up the driveway and introduced himself . He told us he was currently staying at the hunting cabin which is the next 'residence' north of us on our road. When we bought our property we had done some research and discovered that at one point two brothers split a 40 acre lot to create our 20 acres and the 20 acres north of us. One of the brothers built the house on our property while the other brother built the cabin to the north. He helped build our house (his uncle's at the time) and he had lived in the cabin on the property next door. He also said he was hoping to buy back the cabin which his father had sold quite some time ago. He told us the current owner said he could stay there while he, the owner, decided if he wanted to sell the property. Well, we saw our new neighbor every few days for about the next month as he came and left from the cabin. We never heard from him on how the possible purchase of the property was going, but late one night there was a lot of yelling and commotion down the road at his place. We could not hear much of what was going on, but it did not sound good. Alan sat out on the deck in the dark with our shotgun in his lap for a couple of hours. The next day he stopped by to ask if we had heard the ruckus. He said some other neighbors had stopped by yelling, asking what he was doing on the property. We never found out if he actually had permission to stay on the property, but we stopped seeing him a few days after that and the owners came and locked the gate on the driveway. 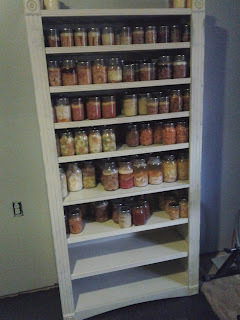 I have been doing a lot of canning this fall and all my canned goods have taken over various storage areas around the house, both in the kitchen and in our guest room. I was working on some planes to build some sturdy canning shelves (remember my sturdy wood thingies from an earlier post?). Well, I am pleased to say I now have two very sturdy shelves for my canning jars and I did not have to engineer them from various scrap items. I volunteer three days a week at a food pantry and they often get donations from various stores and business that are not food related. One day when I arrived there was a nice looking set of shelves that had been donated. My first thought was 'Wow, that would make a great set of canning shelves.' Before I said anything, the director asked if I could use any shelves, they had had quite a number of these donated from a local candle company that used these as display units in the stores that sold their candles. I explained how I canned a lot, and the director gave me two sets of the shelves. They were unassembled in boxes and very heavy, we had to pick them up in our big pick up truck to bring them home and then Alan graciously built them for me, which was not an easy job. Yes, we have performed another upgrade in our off-griddiness. You may recall that we were using a propane powered refrigerator. It looked like a small chest freezer and we hooked it up to a 40 pound propane tank which needed to be refilled about every 3 months. The fridge was adequate but had two downsides. (1) it was difficult to keep a steady temperature and it often became too cold and we ended up with a lot of frozen stuff in our refrigerator, including eggs. (2) We were dependent on going out to buy propane for its operation. During some research time, Alan discovered information about using a chest freezer as a refrigerator. This seemed like a good off-grid solution because the freezer would be well insulated to hold its temperature and would run infrequently enough that we could power it through an inverter connected to our bank of batteries. Thus, we would have a solar powered refrigerator and would no longer need a supply of propane for refrigeration. Our new fridge, powered by our solar system. it is timing the actual 'run time'. (1) We would need more solar power being generated to add in the refrigerator. This was solved with #3 above. (2) Chest freezers are not designed to be able to be set to temperatures above freezing. This was solved by adding in a brewer's thermostat which would control the power cycling. 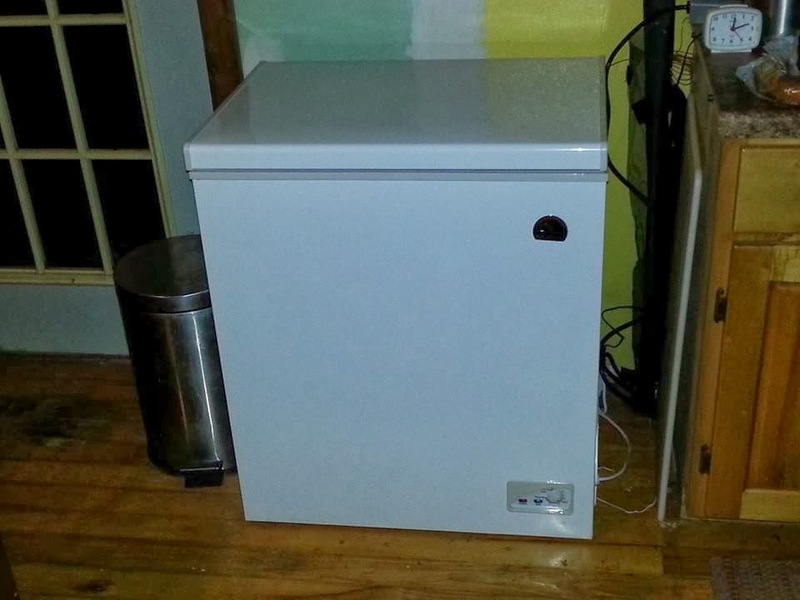 (3) The freezer needed to run off the inverter (120 not 12 volt). This would mean the inverter would have to be on 24/7 to be ready for the fridge whenever it periodically starts up, which would be very inefficient. The solution was finding an inverter that remains off, but checks every few seconds to see if there is something demanding power (ie., the fridge), in which case it turns itself on. With the new inverter and the added thermostat we now have a larger fridge that runs off our solar system. When we first set it up, we also installed a small clock in line with the fridge. This way, the clock only ran when the fridge was running so we could determine how much time the fridge was actually pulling power. At 8 AM we set the clock for 12:00. Throughout the day, we could check the clock to see how much time had elapsed on it, which was 3-4 minutes each hour. At 8 AM the next day the clock (and fridge) had run only about 1 hour and 15 minutes. Once again we went back 'on-grid' for our annual Turkey Palooza - a fun, crazy time with family the week of Thanksgiving. I did enjoy taking some of my home canned meats and vegetables to include in some of our meals. Thanksgiving Dinner with the family. My parents experiencing our off-grid life. We moved their daily Yatzee game in front of the fire. I had told my parents that the average temperature for this time of year is in the 50s during the day and the 30s at night. Well, for the first two days we were in the high 60s, the next day was in the 50s and then we were hit by a winter storm. Freezing rain covered everything in ice, followed by sleet and 5 inches of snow. Normally all of this would have melted within a day, but we have been hit with another weather fluke and temperatures have not been above freezing for 6 days. As I am writing this we have been house bound for six days, schools have been closed since last Thursday and I just heard they are closed again tomorrow (Wednesday) so they will have been closed for an entire week. we shut off the gravity feed tank to the bathroom. There have been thousands of people without power, who have had no heat, lights, etc. for a week. 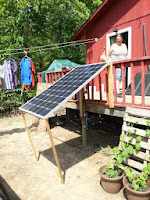 One advantage to being off-grid is that nothing much changed for us. We went through more wood than usual for this time of year and we closed off our outside water tanks and carried water to the bathroom like we did 'in the old days' of last year so as not to have the water lines freeze, but we still had power for lights, TV etc. 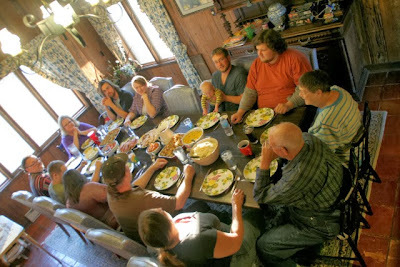 Realizing that while the winter storm has thrown many people for a loop with the loss of 'modern conveniences', our off-grid life was barely impacted and this reinforces that we are reaching the goals we are striving for in self-reliant living.